Sarah McBryde, PhD student in History of Art, discusses a recent workshop considering the value of Art History as a discipline and why the study of ‘old’ art will continue to be important into the future. ‘The Future of Studying Old Art’ workshop, chaired by Dr Dorigen Caldwell (Senior Lecturer in History of Art, Birkbeck) kicked off another day of events celebrating the 50th anniversary of the History of Art Department at Birkbeck, by considering the current state of the discipline and the ways in which ideas about old art are taught and communicated to a wider audience via digital media and cultural institutions. The various speakers outlined their own experiences and perspectives, creating a lively debate on the reasons why the study and display of ‘old’ art continues to have relevance today. Robert Maniura (Reader in History of Art, Birkbeck) asked why we still study historical objects, both artworks and architecture. Why should we care about something which has survived into the modern era, but was created hundreds of years ago in a society with different values and beliefs from our own? He began by posing some key questions for art historians: What is it? Why is it here? Why does it look like that? And importantly, why is it still here when other things have disappeared? Maniura argued that in answering these questions art historical analysis can reveal the underlying functions of art in society; be that to impress, inspire, persuade, provoke, control or mislead. He challenged the view in the mass media that art history is somehow ephemeral, frequently framed as a ‘leisure activity’ unless vast sums of money are involved, and questioned why man-made objects should be any less deserving of rigorous study than objects from the natural world undergoing scientific investigation. 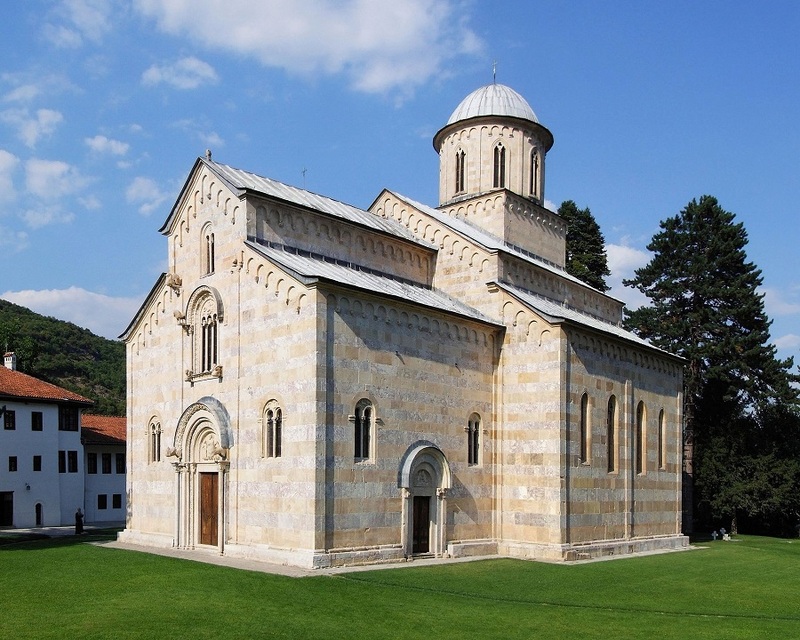 He also addressed the shifting cultural meanings of artworks through history, citing as an example the Medieval Dečani Monastery located in modern day Kosovo. Prior to the 1990s conflict, this Orthodox Christian church was venerated across different local faiths, but now finds itself a symbol of Serbian nationalism in the Kosovo region, surrounded by armed guards and tank traps still under the control of NATO KFOR peacekeepers. 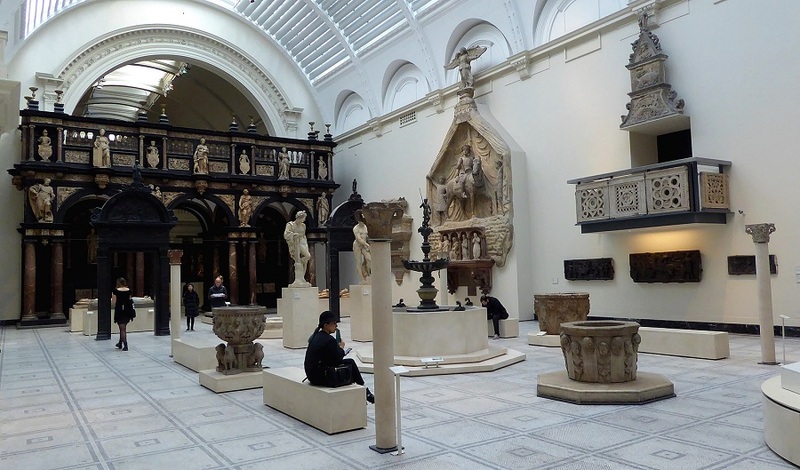 As Chief Curator of the V&A’s Medieval and Renaissance collections, Peta Motture discussed how the galleries were redesigned to incorporate new approaches to the display of objects and the views of museum visitors. The stated aims of the project were to ‘inspire, engage, preserve, connect and transform’ by reformatting the way objects were displayed to provide informative contexts for their production and use, while still maintaining a chronological sequence to the rooms, which the public preferred. Defying some criticisms that particular iconic items would lose their status when embedded in a wider context, the redesign has been highly successful since it opened to the public in 2009. Motture noted that art historical research formed a vital part of the project, which along with gallery design, enabled displays to reflect the historical reality of individual objects and bring them to life. For example, cassoni marriage chests are displayed at shoulder height, as they would have been seen carried in Renaissance bridal processions, and costumes are displayed on mannequins without plinths, so the viewer is directly confronted ‘face-to-face’ with a figure from the past. She also commented on the continuing commitment of the V&A to engage new audiences, finding ways to display contentious objects, such as those with colonial origins, in contexts which reflect our modern and diverse culture and continue to give relevance to old art for future generations. Peter Maniura (Head of Digital Development, BBC Arts) reflected on visual images as vehicles for storytelling, vital to broadcasters like the BBC. He discussed the recent reboot of Kenneth Clark’s Civilisation (1969), reformatted as Civilisations (2018) with Simon Schama, Mary Beard and David Olusoga. Maniura observed that the new series demonstrated the changing attitudes towards art history. Whereas Clark’s version conformed to rigid parameters of what belonged inside and outside the (western) ‘canon of great art’, the new BBC series brought together the distinct perspectives of three separate academic presenters and encompassed a diverse range of source material previously excluded, to both represent and engage a modern, multicultural audience. He also discussed the associated Civilisations Festival, launched by the BBC in tandem with the series to connect local communities with their museums via 280 free public events. He outlined BBC Digital’s continuing projects to develop technology to bring the arts to a wider audience, such as the release of an augmented reality app through which users can manipulate 3D images of museum objects to access information, and #OperaPassionDay, which made live streamed performances and events from opera houses across the UK available via an interactive website. Maniura made the important point that shaping the future for old art is an urgent task to ensure that in a blizzard of visual information, the next generation will choose to engage with our respected cultural institutions. This concern was addressed by the final speaker, Rose Aidin, whose project Art History Link-up, provides ample proof of the appetite of young people for Art History. The charitable organisation, set up in 2016/17, offers a fast-track AS Level/ Extended Project Qualification in History of Art to students aged 16-18 from state schools where Art History is not available on the curriculum. This qualification is free and requires the student to attend Saturday courses held in various partner organisations including the Wallace Collection, National Gallery and Courtauld Institute. Advertised via social media, Aidin noted that the uptake has been phenomenal, to the extent that they do not currently have enough places to support all the applicants. This fantastic programme engages a wide range of students who would otherwise have little or no access to art history education, and takes young people into museums and galleries to experience art directly. She commented on the hugely positive feedback she has had from former students about the impact of the course in developing a wide range of skills, from visual analysis to critical thinking, while also providing an accredited qualification towards their future university applications. As well as benefiting the students, Aidin noted that the courses provide valuable teaching experience for art history graduates further down the line. Currently, the project is London-based, but one might hope that our national cultural institutions may support similar regional initiatives in future. The workshop provided a highly positive view of the future for studying old art. It illustrated the continuing importance of Art History, as well as demonstrating the variety of ways in which the discipline is developing to welcome new and diverse audiences to all aspects of visual culture. As all the speakers demonstrated, in these times of fake news and social media manipulation, the role of Arts and Humanities is ever more important as a gateway to understanding the world around us and also to provoke us to think about and question the ‘facts’ we are presented with. 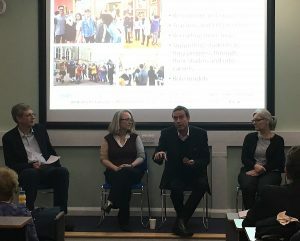 Francesca Castelli, MA Museum Cultures student, discusses the recent Peter Murray Memorial Lecture, delivered by Director of the National Gallery, Dr Gabriele Finaldi. The lecture is named in honour of Peter Murray, who founded Birkbeck’s Department of History of Art in 1967 and is part of Opening Up Art History: 50 Years at Birkbeck, a series of events celebrating the Department’s 50th anniversary. A full house with a captivated audience joined Birkbeck’s Clore Lecture Theatre on 30 November to listen to Dr Gabriele Finaldi as he took us through the events surrounding the foundation and the development of the collections of two museums: Madrid’s Prado and London’s National Gallery. These two museums differ dramatically in their genesis. While the Madrid museum was very much conceived as ‘an act of royal generosity to the nation’, the London institution was born through the will of the British Parliament. Opened in 1819 by Ferdinand VII as the Royal Museum of Painting and Sculpture, the Prado was to all intents and purposes a public showcase of the king’s personal collection. Indeed, all of the 311 pictures came from the Royal Residences in and around Madrid and were the works of Spanish artists. It was not until the nationalisation of Church property in 1868 and the incorporation of the holdings of the National Museum of Painting in 1872 that the distinctly local character of the collection started to move towards a more international dimension, with the introduction of works by Flemish and Italian masters like Rubens and Titian. The National Gallery, on the other hand, was not born through the nationalisation of a royal art collection. It was instead established when Parliament offered a £60,000 grant for the purchase and display of 38 paintings from the estate of banker John Julius Angerstein, including Sebastiano Del Piombo’s s majestic Raising of Lazarus. The National Gallery opened its doors to the public on 10 May 1824 in Angerstein’s former residence at 100 Pall Mall, a building far too small and modest to accommodate a growing museum whose democratic ambition was to be ‘a gallery for all’. The collection was moved to its current location on Trafalgar Square in 1838 and was enriched with important Italian Renaissance works from the likes of Raphael and Correggio, as well as French paintings from the eighteenth century by Poussin and Claude through generous bequests. But it was van Eyck’s Portrait of Giovanni Arnolfini and his Wife, acquired in 1842, that seemed to pique the interest of Victorian crowds with its richness of detail and elegant symbolism. The account offered by Dr Finaldi of the strength of the relationship between the National Gallery and its audience that became apparent during World War II was particularly poignant. At a time when the museum was officially closed and the collection evacuated, former director Kenneth Clark began to organise daily piano concerts that were open to everyone. Myra Hess and other musicians played over 1,600 lunchtime concerts from late 1939 until the end of the war. And in 1942, spurred by a letter written by a member of the public to The Times, Clark was persuaded to take one painting at a time out of storage and put it on display so that Londoners would have something to admire. This event marked the start of the tradition of the Picture of the Month that still exists today, and allowed the museum’s mission to offer the ‘enjoyment of beauty’ to be restored when it was needed the most. Museums are thus places that bring people together and in more recent years both the National Gallery and the Prado have undergone extensive expansion projects aiming to provide a better environment for their visitors, as well as a modern space for their growing collection, temporary exhibitions and conservation facilities. Dr Finaldi’s final point was about the opportunities offered by new technologies and social platforms and how these are instrumental in reaching out to new and larger audiences. Museums are called to have their own digital strategy in order to maximise the potential harnessed by the digitalisation of culture and to help people to experience art in different ways. Earlier this year, in a ground-breaking and unprecedented event, the five museums where the existing van Gogh Sunflowers are located, came together in a sort of virtual exhibition thanks to a live Facebook broadcast and gave life to a fully immersive digital experience supported by VR technology and Computer-generated Imagery. An audience of some 6 million people connected to enjoy an interactive tour of the virtual gallery while van Gogh’s great-grandson shared his personal memories of the iconic pictures.